Now I'm sure by now everyone has worked out that I'm very much into Accessorize's makeup range. I've posted swatches so far of the eyeshadows and a lipgloss and I'm sure that on other blogs you must have seen by now some of the duochrome nail shades they've got on offer. Well now I've got to show you what was actually the first Accessorize product I ever tried! I started my collection with their baked blusher in 'pretty pink' and frankly I'm sure you'll see why I couldn't resist it. After I read a post about the blusher on Lipglossiping my birthday came around in March and I couldn't help it. The gorgeous packaging and glorious swirled colours were calling to me! Because I can't afford higher-end brands I am used to fairly bland packaging but Accessorize as I've said before know their market! For a £5.50 blusher where you get 8 grams of product the packaging is still adorable. Kudos to them! The surface of this blusher looks like the surface of an amazingly girlie planet that I wish I lived on... Well actually it looks like a blend of a pale peachy pinks with veins of lilac running through it. 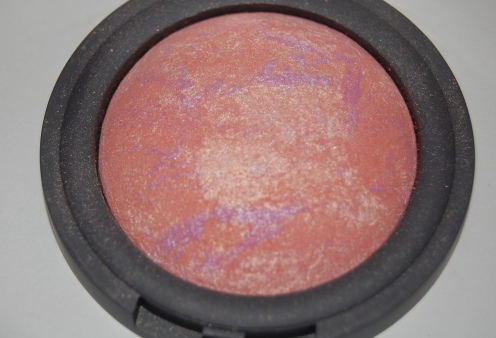 And even though I have very pale skin this shade is still perfect as both a subtle shimmer and blush. 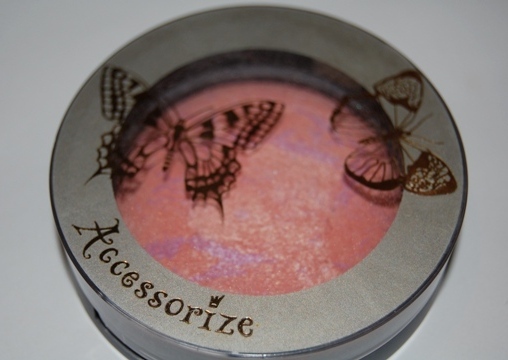 When dusted lightly it provides shimmer and when used more liberally the peach tone really comes to life. The product is very fine and doesn't have heavy chunks of glitter in it. Really I'd say it is very easy to work with. 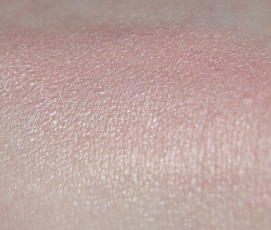 Due to the shimmer in this product it can look a lot paler than you first might expect when swatched. In this swatch where the light hits in the bottom of the picture you can see the highlighting shimmer's effect but if you look towards the top the peach tint is more visible. On my cheeks this product doesn't stand out and look obvious but actually blends quite well with my skintone and adds a natural looking radiance. I'd say that this is perfect for summer and using these products always brings out my girlie side! I loove any kind of merged/baked makeup! @Joanna I love how pretty baked makeup is. @Emily I can sort of understand why it gets snapped up fast! @iryn Thank you so much for following!